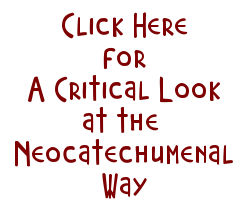 Somebody in the Vatican must have went to work with their red pen on the original version of the Neocatechumenal Way’s Catechetical Directory prior to its “approval”. While we have discussed the abnormal approval of the Neocatechumenal Statute and Catechetical Directory before, here is an example1 of one grave error, among many, that was cut out of the original version of the Neocatechumenal Catechetical Directory. “I always say to the Blessed Sacrament Fathers, they built an immense tabernacle: if Jesus Christ had wanted the Eucharist to stay there, he would have made this in a stone that does not go bad. The bread and wine, the Body and Blood of the Lord, are essentially to be eaten and drunk and only secondarily to be exposed etc. The bread and wine are fundamentally for the banquet, to take us to the Passover. The real presence in them is always the means to take us to an end that is to fulfill the Passover in us. Jesus Christ is present in function of the Paschal Mystery. It is not an absolute? Christ should have used stones? Not so fast. 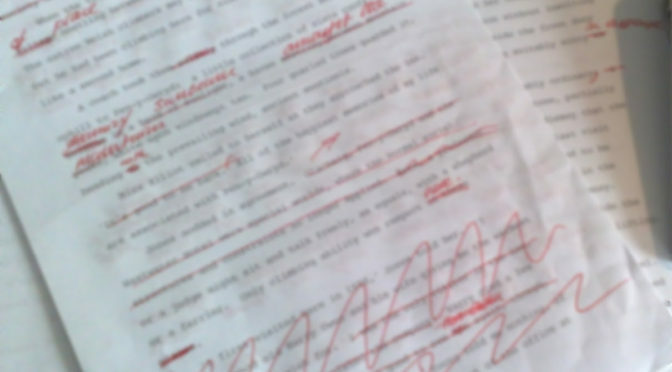 There are still plenty of errors in the documents, which you can read about here. 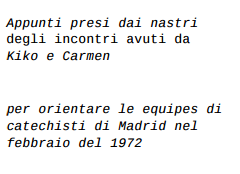 More significantly, though, is the fact that the original catechetical documents were transcribed from tape recordings of Carmen and Kiko in Madrid in February of 1972. 4 These documents contained the teachings that formed all of the men in Kiko’s inner circle, men like Giuseppe and Stefano Gennarini, and Mattia del Prete, and others in outer circles, like the Carmelite catechist Edwin “Pius” Sammut. Men that exert a considerable influence in the sect today. Moreover, there is no evidence whatsoever that communities are being taught using the “approved” documents. They are secret and inaccessible to all but a few. 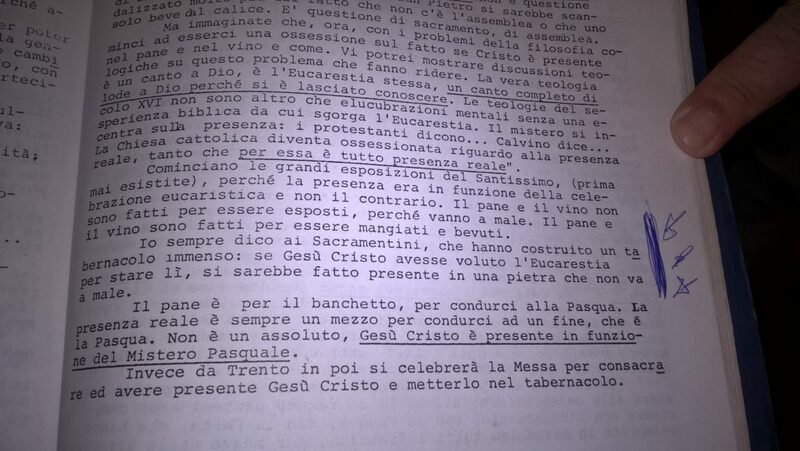 1 This example was provided by Lino Lista, a Catholic layman from Italy. 2 It’s also found on page 329 of this Italian version. “Io sempre dico ai Sacramentini, che hanno costruito un tabernacolo immenso: se Gesù Cristo avesse voluto l’Eucarestia per stare lì, si sarebbe fatto presente in una pietra che non va a male. Il pane è per il banchetto, per condurci alla Pasqua. La presenza reale è sempre un mezzo per condurci ad un fine, che é la Pasqua. Non è un assoluto, Gesù Cristo è presente in funzione del Mistero pasquale”. Devo ringraziare il mio amico, Lino Lista!